We are living in an exciting time of Earth’s evolutionary process, referred to by many as Earth’s ascension. It is a time in which many will awaken to a greater awareness and a greater reality than they have known so far, and indeed many are awakening or have already awakened at the time of this writing. Yet many more have not yet begun to awaken, and so the population of the planet is currently moving through many diverse stages of the ascension process. Whether you are struggling to extract yourself from difficult circumstances and emotional drama, finding your personal power, wanting to discover and develop your innate psychic abilities, or just seeking answers to who and what you are, why you are here, and why you experience the things that you do, this series of eBooks has been written to assist you along your journey. in the collective energy field for others to follow. This means that, no matter where you are along your journey, by seeking expansion you are contributing not only to your own ascension but also to the ascension of Earth-humans everywhere. So you can be proud of your important role, because every positive step you take is of great value to us all! one like it again. Humans have already begun asserting their birthright of self-love, reclaiming their power, and accessing their own unique abilities, including using and understanding all of the extra senses we have been unable to use or have been discouraged from using before. Each person who makes this happen widens the door for others to enter. In the not-too-distant future, all of us will heal ourselves and actualize love, and together we will become a powerful collective. I am grateful to be a part of it and I thank you for being a part of it, too! May this information be beneficial for you and also for all those with whom you come into contact. There is nothing wrong with you. You are not the only one who has this expe- rience. In fact such experiences occur often and are perfectly normal. Many people hear things that do not originate physically within hearing distance of their ears. This can happen in many different ways, including through the psy- chic gift known as clairaudience. Clairaudience means “clear hearing” and is the ability to receive information psychically by perceiving it as sound or as spoken language. Moses, Abraham and other prophets of faith are well known exam- ples of people who were clairaudient. There are many entities that are interested in speaking to us. This includes departed loved ones, ascended masters, angels, spirit guides and many other kinds of nonphysical beings, often highly positive. 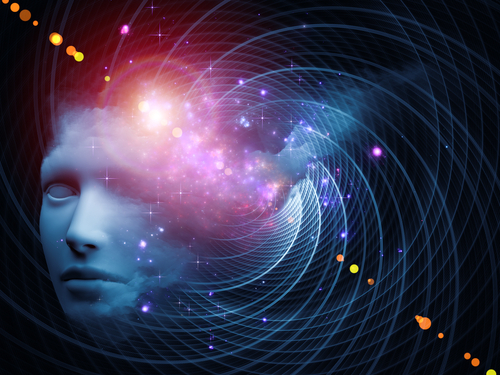 Many extraterrestrials have the ability to project their thoughts psychically, as do interdimensional beings, animals and even some psychic people. Their projected thoughts are often perceived clairaudiently, that is, they are perceived as being heard when in fact there is no sound occurring “in the air”. Many of these beings are positive but some are not. Thought-forms are often heard in this way, that is to say, our own thoughts can speak to us and other people’s thought forms can too, and especially if we resonate with them, they may feel like our own. As you probably know, some thoughts are worth listening to and many are not. It is also important to know that there now exist “secret” technologies that ena- ble ordinary physical people to project thoughts into other people’s heads tele- pathically. If you suddenly begin hearing a voice communicating with you out of the blue, please be aware that the entity or being speaking to you may or may not have your best interests at heart. This means it is wise to ask questions to discern who is talking to you. Be direct. You have the right to be skeptical, even if—or especially if—the voice calls itself “Father”, “Jesus”, the “Creator”, “God”, and so on, since negative self-interested beings will often pretend to be something they are not. Highly positive ad- vanced, angelic and/or divine beings will not be offended by your asking about their identity—quite on the contrary they will very much understand your need to know who you are talking to. It would be wise to be informed of this technol- ogy if you think you may have been contacted. Perform a discerning search for the “voice of God technology” and educate yourself if you think you are being contacted. Many voices have important messages for you, including & especially the voic- es of your higher self, your spirit guides, and other positive beings. If you listen carefully, you can hear and benefit from the wisdom that exists in the higher realms. If you agree to silence the voices altogether with pharmaceutical drugs or other substances, this will not only prevent you from accessing your own inner wisdom, it will also put you at risk of a host of side effects ranging from undesirable to deadly (if you research to inform yourself about side-effects of phar- maceuticals, especially psycho-pharmaceuticals, you will quickly see what I mean). If you develop the ability to discern the positive voices from the negative ones, the positive ones can guide you toward your highest joy. Remember that you may be hearing the voice of your higher self, the eternal part of you that wants you to be happy. Your higher self will always say things that are empowering and that are respectful of your free will. You may be given guidance but it will always be your choice to follow it. Any voice that: 1) makes you feel disempowered, discouraged or undermined; 2) tries to feed your ego by saying there is something special about you that makes you more valuable than others; or 3) that commands you to do things without consideration of your free will, is not your friend. If any of these things happen, tell the voice to go away and stop paying attention to it. If the voices you hear are impelling you to participate in addictions or other harmful behaviors, remember that your higher self would never lead your incarnate self to do harmful things. Voices that do this, and negative self-talk in general, come from thought-forms, sometimes called demons, which seek to feed off of your negative emotions and drain your energy. These symbol- ic personal demons only have power over you when you agree with them, which may happen consciously or unconsciously. They cannot hurt you with- out your cooperation. What you feed grows, so it is wise to not feed negative thought-forms by obsessing over fears or otherwise agreeing to think along with their sugges- tions. When you start to disagree with them and cease participating in their schemes, so to speak, they will lose energy, you will start to become free from them, and you will hear them less and less. It sometimes happens that the higher self or other positive beings give us advice that makes us feel uncomfortable. You may be in a relationship or other situation that is harmful to you, and you may be feeling confused and frustrated about to what to do, if you have invested in false beliefs about yourself, your reality and/or your situation. could be that you need to make some difficult decisions and even make some drastic changes to achieve that. Your higher self and spirit guides would never lead you down a path that would be truly harmful to yourself or others, even if it may seem that way according to the false beliefs some of us still hold. In order to have effective discernment, the most important thing is to become clear by aligning with yourself and your own heart. * Being in alignment with your- self means that your thinking is not clouded by thoughts that came from other peo- ple. It means that you know your own self and who you truly are and what you desire and that you are no longer keeping emotions from past experiences sup- pressed but have worked to uncover, process and integrate them. It also means that you are aware of your body’s messages to you and you are keeping it and your mind healthy. When you are in alignment with yourself, you will know yourself, and so you will im- mediately recognize anything that is not in alignment with yourself, your intuition or your feelings. Self-awareness leads to self confidence, clarity and mastery. Becoming an open channel for spirit is beneficial for many things. First of all, it can help you personally to improve your life. Second, you can help others who are not as far along as you are on your journey. The more clear you become about what you are hearing, the more helpful spirit can be for you. Meditation is one of the many things you can do to become clear. Sitting quietly and being present with yourself will help you sort out your feelings about what you are hearing. Sometimes you may feel bothered or uncomfortable when you hear your inner voice. This is a good sign that it is time to slow down, stop what you are doing and listen. When you quiet yourself you can listen to your mind, sort through the many things you may be hearing, and pick out those voices that offer guidance towards your highest good. When you hear what your positive inner voices have to say, you can be helped to make choices that lead you into greater consciousness and joy. When you practice meditation, you are connecting with the divine part of yourself. If you also set the intention to clear the negative energy in your auric field, raise your vibration to the frequency of love and/or enlightenment, you will be able to connect with your higher self and your spirit guides. What does it mean to raise your vibration and how do you do it? Your feelings follow your actions. Try smiling at yourself in the mirror, smile at strangers on the street, open the door for the person behind you, let someone go ahead of you when you are waiting in line, look for ways to be kind in everyday random circum- stances. When you do things that make you feel good about yourself, your vibra- tion is higher and you single-handedly create the kind of world you want to live in. In time and with regular practice, you may also be able to become a channel for benevolent extra terrestrials, angels, or other multidimensional beings if that is something you desire to do. The main thing to remember when seeking this higher understanding, is that it is more about doing the inner work to clear the low vibrations within you than it is about gaining extra sensory gifts. When you do the inner work to become a better human being, the extra sensory gifts will come as a fruit of your labor. to what our institutions taught us. Now, however, we are seeing miracles happen every day. By taking action to become a high vibrational person, with a clear con- nection to Spirit, you are anchoring the light for creating a new reality on this planet! I sincerely hope you have benefited from the information contained within it. You are on a divine journey and every experience you have is essential to the healing and expansion of the collective consciousness. I honor you for taking on this life and taking in knowledge of how to be- come the greatest version of yourself that you can be. If you haven’t already, please subscribe to my social media channels and watch my blog for new articles and videos. Thank you again and may you have all you want in life! F*ckin’ awesome issues here. I am very happy to peer your post.